During a recent trip to California Chris had the opportunity to visit my Uncle Ron who lives in Brentwood not too far away from where I was working. To read more here is the blog post 2008 Cline Cellars Heritage Zinfandel. Another wine that Ron gave Chris as a gift for home was the 2011 Cline Oakley Eighty Two White wine. Recently when Chris was making a yummy seafood risotto with shrimp and lobster claws, I wanted to pair the risotto with a light white wine. Wandering through my cooler I came across the Oakley Eighty Two. 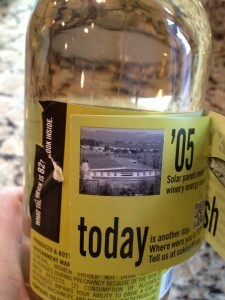 I was not familiar with this white blend so I read the back label on the bottle. 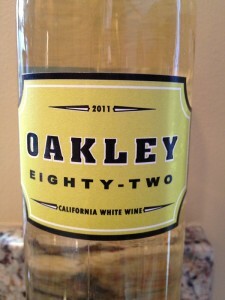 It read: OAKLEY is home to some of California’s oldest and rarest grapevines known to produce intense, aromatic wine. 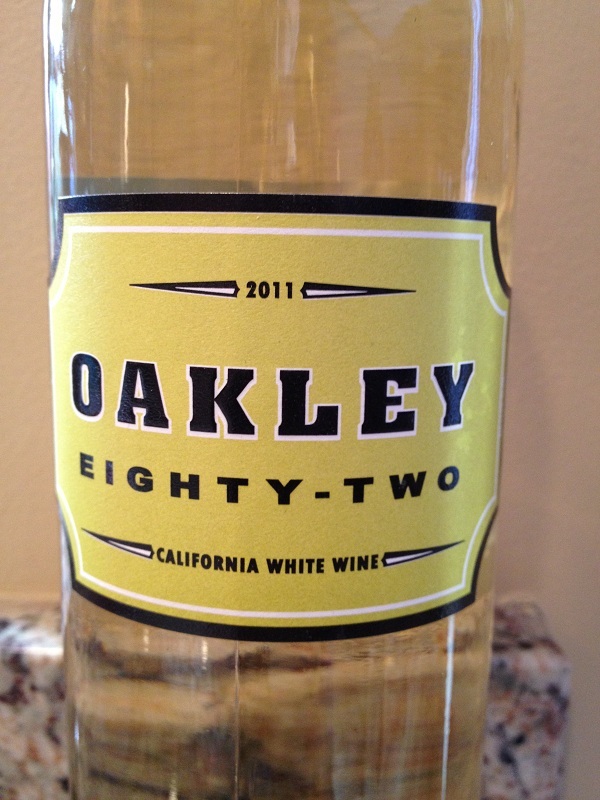 Oakley Eighty-Two is delicious alone or with chicken, fish or salad. Serve slightly chilled to enhance the wines’s citrus and peach notes. I also discovered on the back label was a black note “What the heck is 82?” Look inside. The label was designed to be pulled apart with additional information. 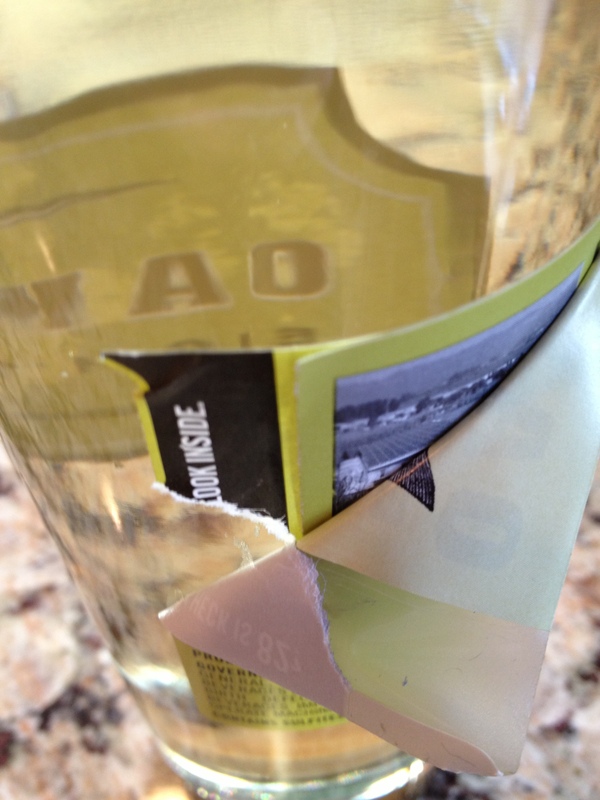 I struggled trying to pull the label and accidentally tore it. After a little more finesse, I was able to separate the label. The color depth was thin with a slightly clear to amber hue. Very aromatic and fruity. I could smell citrus and peach. Sweet and light bodied. The Eighty Two was slight tart. The flavors were peach, grapefruit, slightly buttery and it was crisp. The finish was nice and long and could be felt on the rough of my mouth. 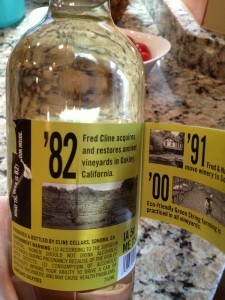 Both Chris and I enjoyed the Cline Oakley Eighty Two and it paired very well with the seafood risotto. Thank you Uncle Ron for yet another fine wine! 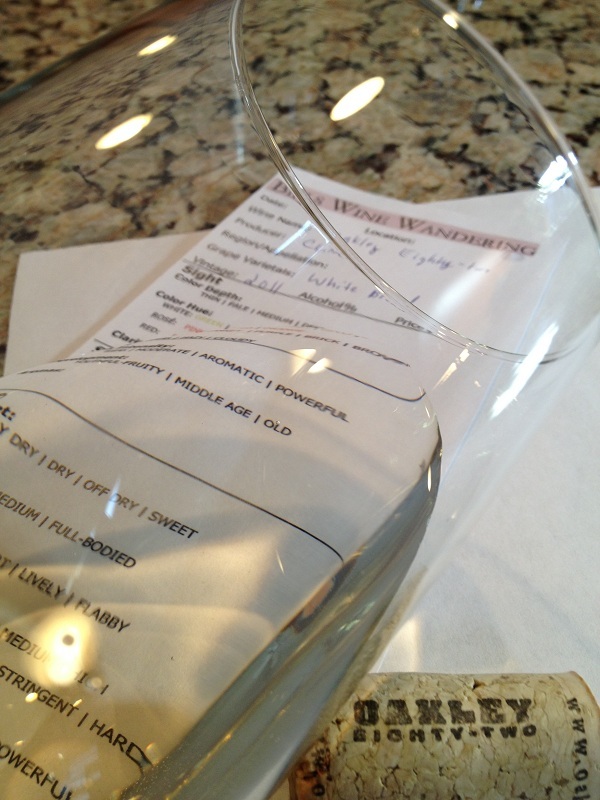 I rated the 2011 Cline Oakley Eighty Two three glasses.